Located near the intersection of W Century Blvd and S Prairie Ave, Extra Space Storage serves residents of Inglewood, Lennox, Westmont, and West Athens. Locals will recognize our facility across from Hollywood Park Casino a few minutes west of Costco. 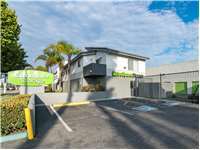 Do you need a storage unit close to Los Angeles International Airport? Extra Space Storage is about 5.8 miles from the airport, offering secure, affordable storage options for Los Angeles residents and visitors. Extra Space Storage on W Century Blvd offers a wide selection of storage units, drive-up access, and exceptional security, making us a convenient solution for your storage needs in Inglewood! Our Inglewood storage facility has unit sizes from 3x5 to 15x24, making it easy to store items large and small! Units also include features like indoor access, first-floor access, and elevator access. Concerned about storing valuable belongings? At Extra Space Storage, we utilize security measures like an on-site resident manager, 24-hour video surveillance, and electronic gate access so you can store your items with confidence. With a drive-up access unit, you can save time and energy while unloading or loading items! Simply pull your vehicle up next to your unit and avoid the hassle of stairs, elevators, and hallways. Drive-up units are available in sizes 4x5 to 15x24. From our clean, secure, well-maintained facility to our friendly, professional team, Extra Space Storage goes the extra mile to ensure our customers get the storage solution that meets their needs. We also care about providing an excellent experience, so please let us know if you need assistance or have any questions. Contact us today to reserve a storage unit in Inglewood! Extra Space Storage have excellent customer service friendly and very attentive too your needs. Great location that is always very clean with I go there. Also, excellent customer service for the employees. Can't beat the price for the area. So far I'm delighted with my choice of choosing this place to store my valuables! Great, friendly, and helpful staff and to top it all off, first month is free! Great customer service from signing up to leasing itself. Employees go beyond and above for us. I have rented with Extra Space before, on Centinella. I was very satisfied with my storage unit and the facility location. Now, I am renting a storage space at the Century, Inglewood, Extra Space. The price was right but the facility is ghetto. No security cameras, no security guards for after hours. Therefore, unlabeled people run the premises at night. Thank you for the help and for the really good customer service you and taking the time two make everything clear and they make you feel like a home with a lpt oc respect i loved the way i was heplp and tgey explaineverything thank you John.. It's not fancy, but it gets the job done. The people working there are considerate and respectful. I made a reservation online to get a lower rate. They honored it and it was no problem. The woman at the desk went through all the details and encouraged me to read the contract in case of anything in the future. The facility could use a facelift but nothing that prevents storing your materials. There are elevators and carts available. You use a personal code to get in and out the gated facility. IMPORTANT: When using the unit after business hours make sure you are out on time! Otherwise you will be locked in! The place for storage. Great services, Great prices, Great location! I went to the Inglewood location. John was a tremendous help!!! He was friendly and efficient. He was very detailed about my options. The process wasn't lengthy. He even gave me a referral for an awesome mover. He helped eliminate a lot of stress from our move. I recently rented out a storage unit with Extra Space and I am very happy with my decision. It seemed as if they truly cared about my needs instead of just taking my money. The manager there was so kind and gave me the best deal he could. I would refer them to anyone I know in need of storage.I received excellent customer service and there facility is very secure. Extra Space storage is a very secure place. I am very satisfied with the customer service and the service they bring overall. Its my first time using a storage facility so i was a bit worried not knowing what size unit i needed but after speaking with property agent 'Angel' and having him explain my options made it easy and helpful. I Will definitely recommend this facility in the future and I'm happy with my experience at this facility and agents helping me move. So far my experience with ExtraSpace has been very nice. The customer service at the Century location has been excellent. Went in on Saturday to rent a unit and was out in about 20 minutes. The staff was very helpful. I would recommend to others looking for storage space. This location is close to my home and conveniently close to 3 freeways so it is easy to get to. I was able to get a great deal for a large unit and am on a month-to-month contract so I can switch to another unit if I want. I was in a hurry to clear out an apartment and garage & didn't have time to sort through all the boxes so I put everything in storage. Now I can go through all the boxes at my leisure and decide what is to be kept, what is to be donated and what can be thrown away. I will then decide if I want to move to a smaller storage space to save money. The items that I'll keep will be repackaged in good strong boxes, I'll snap some photos of what's inside & put labels on the boxes. That way I can keep an inventory on my computer at home and will know exact what item is in which box. Went in and in less than 15mins i had a space for me. The reps are friendly and also are very helpful!!! 10stars!! When I called in to inquire about the space and pricing the customer service given at that time was very impressing. At the location once visiting the space, was very efficient and fast. I liked the level of knowledge the assiciate has as she was able to answer all of my questions. I am happy with the service thus far although I wish i wasn't called the day my payment is due. Also,I was accidentally called about my unit being vacated when in reality it was not. ..Its human error, so I understand. Overall I would recommend this location. I had an emergency move, and after paying someone to help me move and load up the van my money was very low.but thanks to extra space storage there rates were very affordable when i didn't have much.they were a blessing to me.. The staff is wonderful and very helpful! All my needs were met when I got my storage unit! Olivia was very helpful when I came to pay my storage unit! This is my second time using Extra Space storage! There awesome! As a small business owner its been great having a place near my business to store product and keep the overhead down. THE PROPERTY IS IN GREAT FORM AND FOR ME AND MY FAMILYS 1ST TIME RENTING A STORAGE I THINK WE MADE AN GRADE A CHOICE....THANKS AND KEEP UP THE AWESOME WORK!!!! My overall experience with this facility has been excellent, but the last couple of month's, with the personnel change, the level of service, when making payment's has been rather slow. I guess this is a good sign because people are booking at this facility, but my prior payment experiences took less than 5 minutes. The last 2 month's I have waited 10 minutes or more before being serviced. I must admit that an apology was extended both times, and the first delay was attributed to the computer system being down. Other than that this is a great facility. Traveling South on the 110 use the Century Blvd offramp, making a right to head West. Our office entrance is just past Doty on the left hand side. If traveling from the 405 South and head East on the LAX / Century Blvd. exit. The facility is located just past Prairie Ave, directly across the street from the Hollywood Park Casino. Our parking lot is on the right hand side of Century Blvd. Traveling North on the 110 you will use the Century Blvd offramp, making a right hand turn to travel West. From the 405 North use the Centruy Blvd off ramp. The facility is located directly across the street from the Hollywood Park Casino between Doty and Prairie Ave. Traveling West on the 105 you will use the Prairie Ave / Hawthorne Blvd off ramp. Keep right to take Prairie Ave, making a left onto Prairie Ave and then a right at Century Blvd. The facility is located directly across the street from the Hollywood Park Casino between Doty and Prairie Ave. Traveling East on the 105 you will use the Prairie Ave off ramp, making a right hand turn onto Prairie Ave.. Drive one mile and make a right hand turn onto Century Blvd. The facility is located directly across the street from the Hollywood Park Casino between Doty and Prairie Ave.